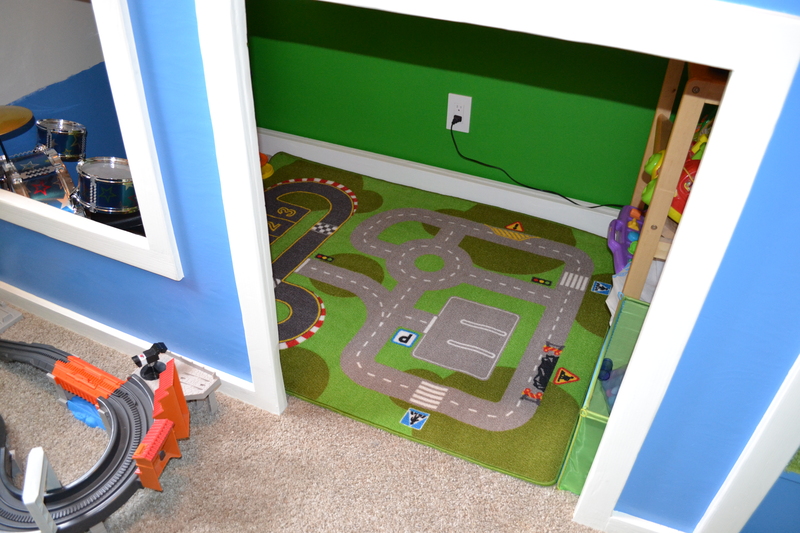 Peeps, I am super proud of Liam’s new room. 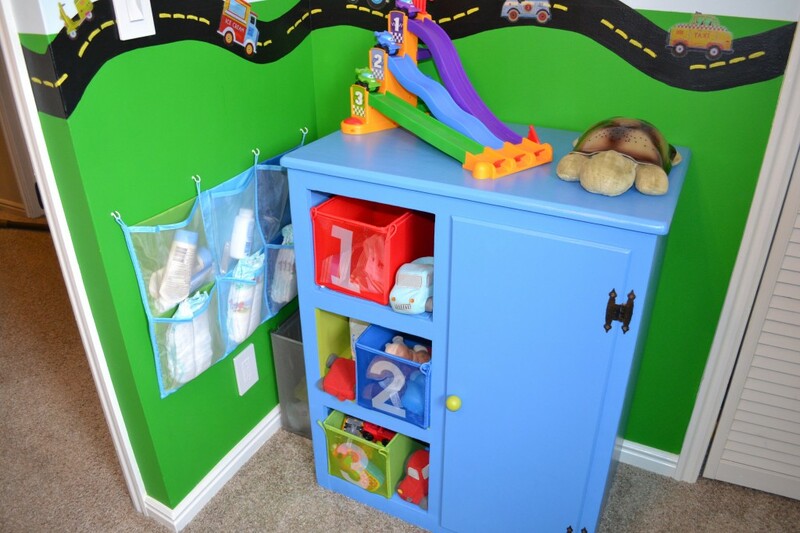 If you’ve been over to our house any time recently, you know this since the first thing I do whenever anyone comes over is squeal, “Come see Liam’s awesome new room and super cool bed and bedspread as the lovely brown knitted one here! (Oh yeah… over there is my new baby if you want to see that too. )” I’ve finally got some good pictures though and I’m ready to detail the process to you all. That there is your basic beige horror of a room. 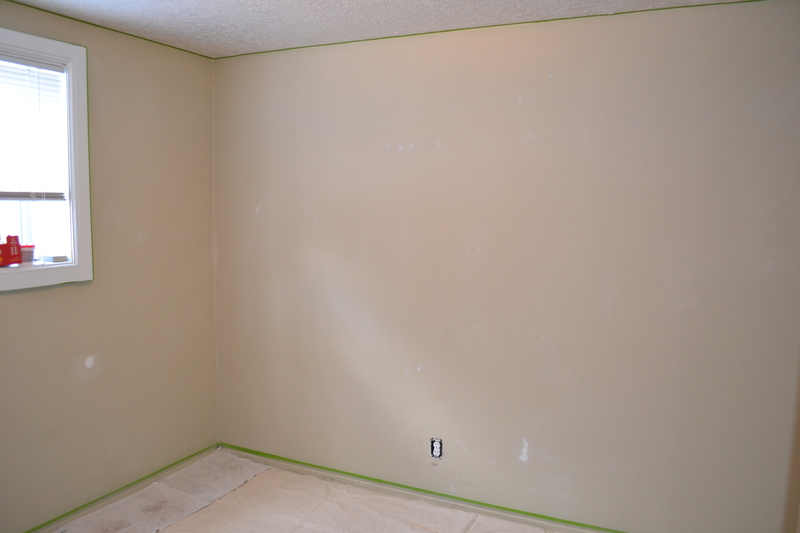 The guy that painted it before we moved in even had the brilliant style sense to paint the baseboards the exact same color as the walls! Another challenge this room presented is that it’s a TINY basement bedroom. Thankfully, it gets a lot of light, but it’s so small that once you get your basic bedroom furniture in there, there’s no room for anything else. 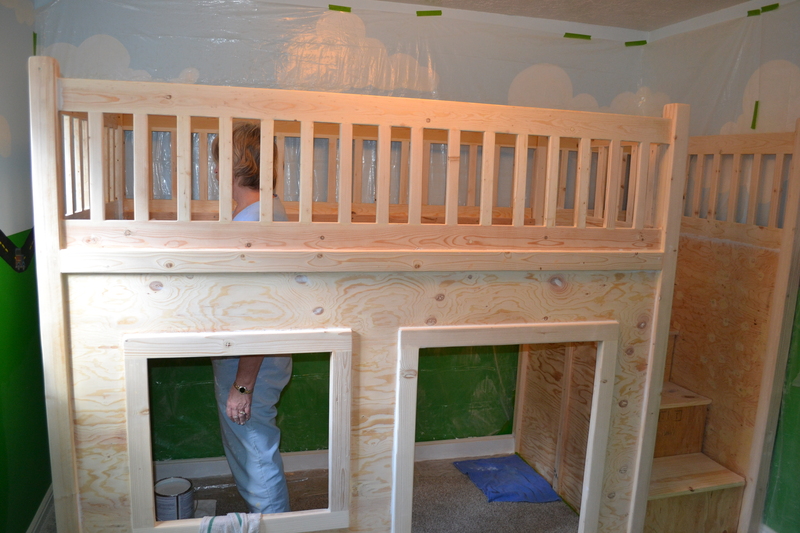 That’s when we had the idea to get a loft bed with a play area underneath. I looked for pre-made beds online, but they are PRICEY. Especially since we needed one with STAIRS and not a ladder. Those are almost always over $2000. Ridiculous! Then we found free plans online here. We considered briefly building it ourselves, but we weren’t super comfortable with the idea that our son would be sleeping several feet above the ground on something WE built. So we found a guy who builds custom beds and put in an order. I’ll get to the bed later though… back to the room. 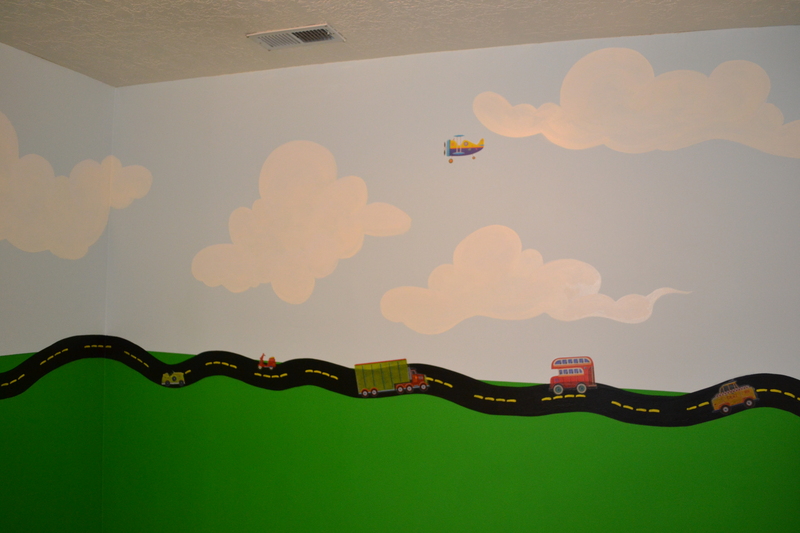 After a lot of thought, I decided on a cars/trucks theme for Liam’s room. So I searched the internet for some inspiration and finally had some ideas brewing. 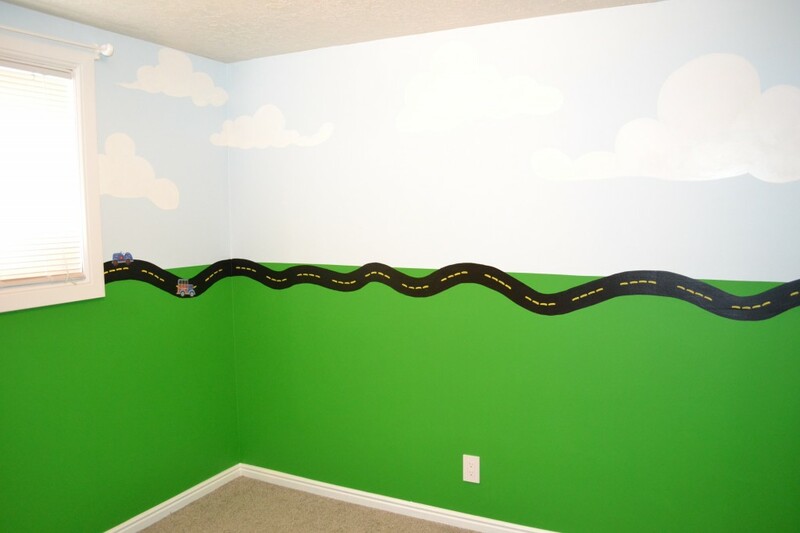 The basic concept is that the bottom half of the room is green (grass) and the top half is blue sky with clouds. The two halves are separated by a little road with cars and trucks driving by. 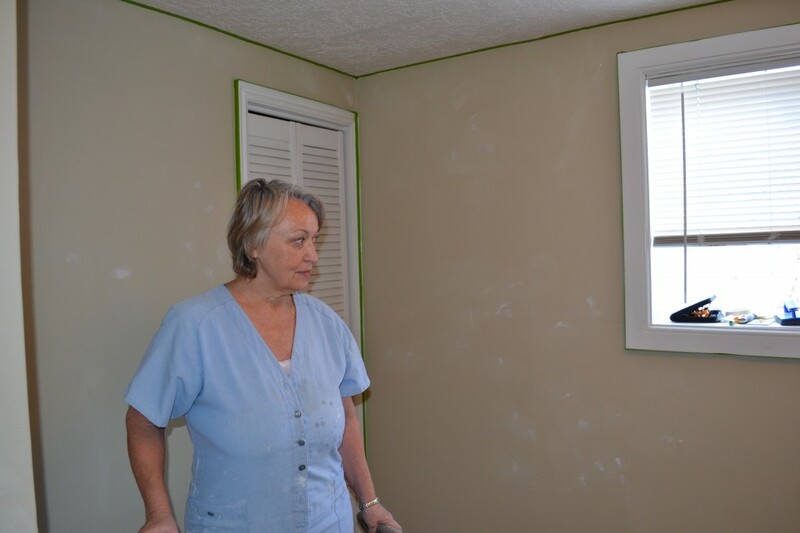 So first we start by painting the top half a light blue and the bottom half green since we’re focusing on the interior rooms of the house, aftewards we may tray some exterior painting by hiring some company. For the road, I made a couple of stencils out of cardboard and we traced the pattern around the room, flipping the stencils occasionally to add variety. Once the black road was painted, I added the yellow road markings by dipping the tip of a cosmetic wedge into some bright yellow paint and just stamping onto the road where I wanted them. My mom painted the clouds in the sky. Then we added these cute little decals I got off of Amazon for only $9.99! Adorable, yes? See that cute clock? I bought it at Ikea for $9.99 and then added an extra decal from the set myself so it looks like we bought it as part of a set or something. I couldn’t be happier with the results. 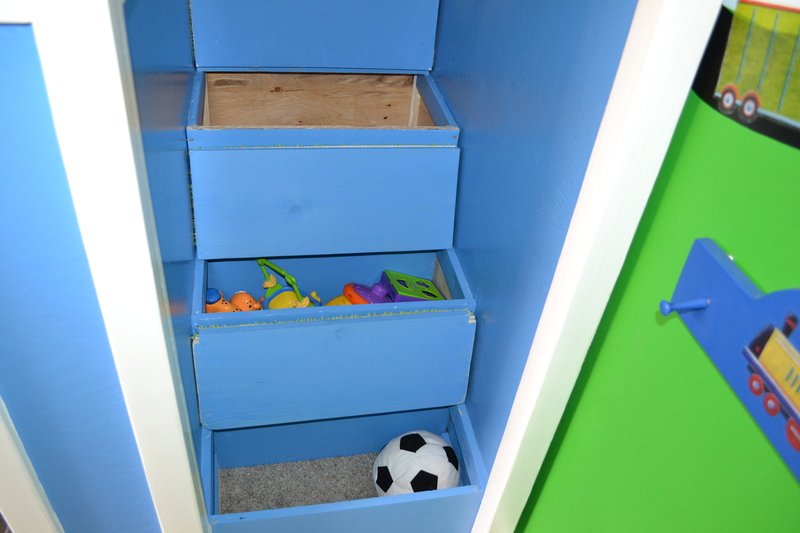 We chose the colors based upon some shelves I picked up Ikea and had the colors custom made to match. This turned out to be a brilliant idea because then I was able to find tons of cute accessories at Ikea for cheap that matched the room perfectly! 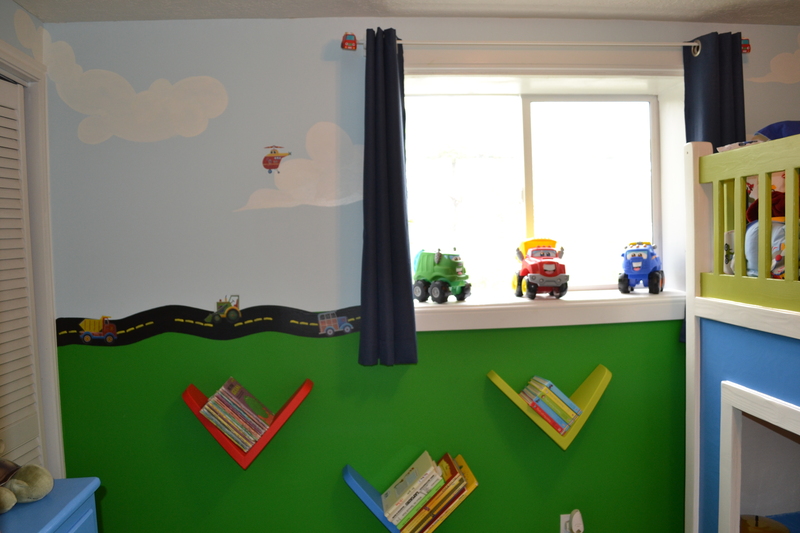 These are the cute shelves I picked up at Ikea for Liam’s books ($6.99/each). I picked these specifically because Liam gets really frustrated with a conventional book case when the books tilt slightly or fall over. This way, all the books are neatly tilted at the same angle for my little OCD boy. 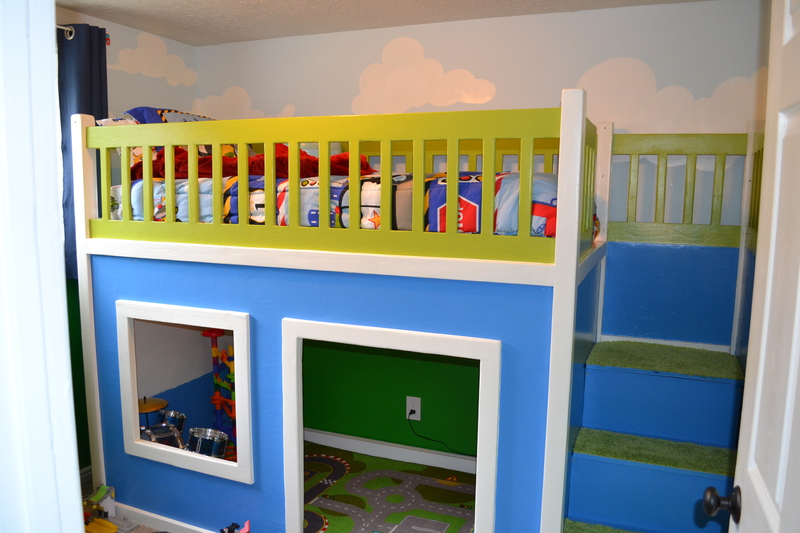 I wanted the stairs to the loft bed to be carpeted in case Liam fell. At first I thought I’d have to order carpet because I wanted it to be the cute lime green from the railings on the bed, but it would have cost me over $100! Instead, I had the idea to use bathroom mats and found this one at Ikea which matches perfectly. And how cool is this? 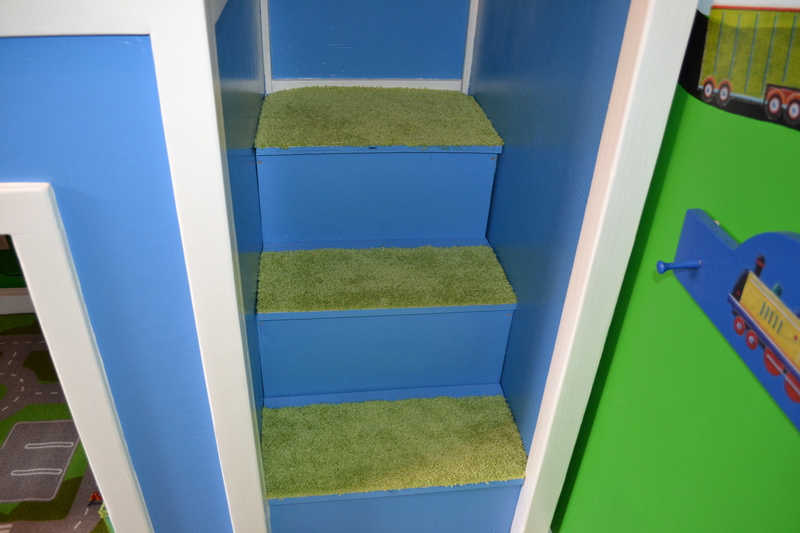 The stairs are actually little storage bins. They go all the way to the floor, so the top step is super deep and I just use it to store a bunch of old bedding and extra pillows and things. The smaller bins hold toys since Liam can actually get into those. My mom and I put a lot of time and energy into this room and I think it shows. I could not be more pleased. 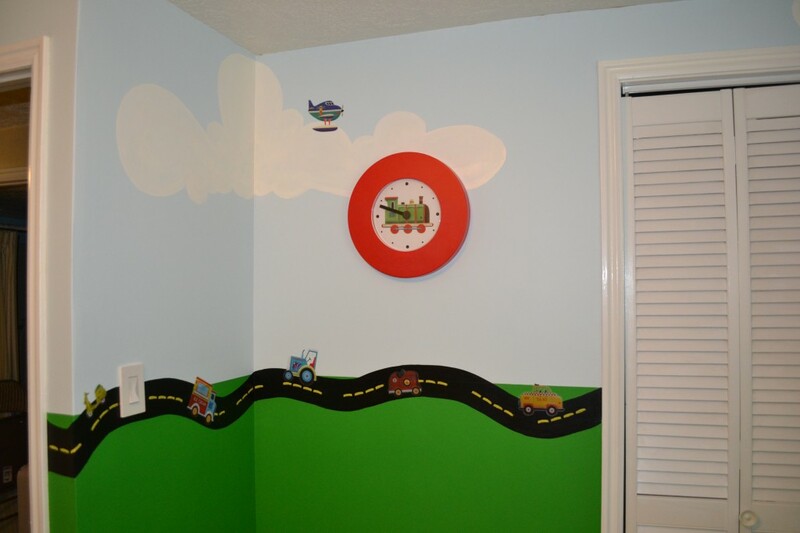 I know I am a bit biased, but I think it’s the cutest little boy’s room I’ve ever seen and Liam LOVES it. That looks amazing! So much work, but Liam will definitely use and love it for a long time to come. Woooooooooooooooooooooooooooooooooooooooooow!!! Liam’s room is soooooooo awesome! Love it!